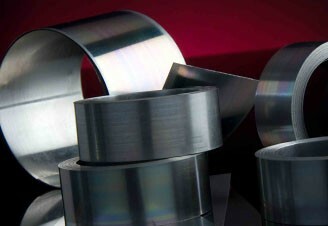 Magnetic Shields are a global supplier of MuMetal Magnetic Shielding Foil. Our standard stock ranges of cold rolled, stress annealed MuMetal foil (Grade ASTM A753 Alloy 4) are available in a variety of gauges and widths for rapid delivery worldwide. Please see our standard stock list for available options. MuMetal foil is typically used in delicate applications within the low frequency range where sensitive devices are impaired by magnetic interference. MuMetal Foil provides very high permeability and exceptionally low coercive forces and magnetic losses. * Please contact our sales team to find out more. 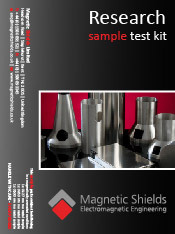 Do you require a selection of mu-metal sheet/foil in a magnetically annealed condition, for initial research and testing? Why not try our Research Sample Test Kit ? All of our materials are supplied with a Certificate of Conformance as standard. Additional certificates/graphs can be supplied for chemical/magnetic analysis and heat treatment* upon request. Please Note: As standard, our magnetic foils are supplied stress annealed for stamping/fabrication purposes and should receive a final magnetic anneal to achieve optimum magnetic properties after fabrication. Please refer to our heat treatment section for further details.